This is the story of our two year preparation to become fulltime RV'ers, and our big, new adventure that began on May 31, 2015. It's just the two of us, and the "fluffy dog", off to see this beautiful country with only the seasons as our guide. We're really doing it! I read the message and can't read it to Bill. I think I'm in shock. Handing him my phone to read, all I can think of is Aunt Nancy and how devastated she must be. Last year when we were here we missed seeing cousin Trish and her family because they were moving her mother, Aunt Nancy, from Roswell to Ogden. I've only met her and the family once at the reunion four years ago. Bill doesn't know the "kids" well, only seeing them at previous reunions. We do know Aunt Nancy well, and love her dearly. We also know how close she is to Trish's oldest, and her first grandson, Nathan. The message explains that Nathan was killed in a tragic, freak gun accident on Tuesday night. We're both speechless. We were hours from visiting and getting to know him and the others better. I let Penny know we got the message, that they should not worry about us at all, and offer any help we might be. I never know what to say when a loved one is lost. When my late partner, Jeff's dad, passed away it was exhausting navigating other people's grief and good intentions. We don't want to be those other people. It's a very quiet drive to Ogden where we set up at Wasatch View Estates. We've stayed in many places with "view" in their name, which is almost always wishful thinking. Here, it's accurate. Beautiful view of the Wasatch mountains out our window. Now the "estates" part is definitely a stretch! The sites are cracked concrete and grass that isn't well maintained. No WiFi away from the clubhouse. But it's fine for the few nights we'll be here. Penny and I connect on Thursday and she and daughter Katie want to see us. She'll let us know later where and when. After a slow start, I suggest we spend the day at nearby Antelope Island State Park. Another place I've read about in our friends' blogs that I think we'll like. It's the perfect place to get re-centered. The Utah we've seen is filled with bold, acrylic paint, colors. The island is a new world of hushed watercolor vistas. The small visitors' center is nicely done and we have the viewing room to ourselves for the movie. Not as informative as we'd like, but it does give us a good summary. It definitely shows how beautiful this place is. The largest of eight protected islands in the Great Salt Lake, Antelope Island is 28,000 acres and 15 miles long. The Garr family owned and ranched the island until it was sold to the state in 1982 and the park was established. Public visitation was limited and completely stopped in 1983 when flooding destroyed the southern causeway and only land access. It was not restored until 1993 when visitation resumed. A haven for birds, the large number of insects being a draw for feeding thousands of migrating flocks. The same insects that often send humans running for the mainland! Although there is a sign at the entrance warning that the biting gnats have hatched, we don't see or feel any during our visit. The bugs have their own section in the VC! The muted colors are very calming. We speak in quiet voices. The mountains in the center of the island are surprising. The highest point is Frary Point at 6, 589 feet. Validation that the hill we just drove up was really steep. A small bison herd was brought here by the ranchers, and included in the purchase of the island. With no natural predators, the herd has grown to over 500. An annual sale is required to manage the growth. The namesake antelope continue to populate the island, although we only see a couple in the distance. Big Horn Sheep were brought here as a protected "nursery program". Once they reach a certain age they are relocated to areas where their numbers have fallen. Bobcat, coyotes, badgers, ground squirrels, chipmunks, and lizards also call the island home. And of course the millions of insects and all the birds! A good size herd grazing along the salty beach. Most of the herd hangs out by the old ranch. So glad we came here. I have a new found appreciation of the beauty of the Great Salt Lake. Bill wants to see Aunt Nancy, as do I. Fortunately as we're leaving the park, Penny calls to say she's bringing her mom to dinner. It's wonderful to see them both. We're relieved to see that Aunt Nancy is doing okay. Clearly the loss is taking it's toll, but these are strong women who have survived previous loss. It's good to get caught up and even have a few laughs together. Thursday we do home stuff and get the grocery shopping done. In the evening we meet Penny and her son-in-law, Jesse for a delicious Asian fusion dinner. Daughter Katie has stayed home with her little boy Desmond who isn't feeling well. We touch on the tragedy of Nathan's death and how he will be missed. The civil service office where he worked closed for two days after his death. 400+ are expected at his memorial service. Such a loss to so many :-( Even with the sadness, we enjoy another great visit. Saturday morning we're back on the road. Prairie on the west and mountains on the east, it's another pretty drive into Idaho. Thunder storms in the forecast, we can see the dark clouds heading toward Idaho Falls. The rain starts right before we pull into Snake River RV Park. The thunder is aMAzing! It rolls non-stop for nearly an hour. It's wonderful to be back in the rain. I can't remember the last time. The park is nearly full on this post Memorial Day Saturday, but we have a nice pull-through site with 50 amp FHU. It's a clean park with dirt roads and sites and lots of tall trees. WiFi works okay and our satellite connects. This is a fun one night stop just because we were last here with good friends Jim and Diana (ExploRVistas) At the time we were both trying to escape all the terrible smoke. Rain is much better! We treat ourselves to a nice dinner at Sand Piper Restaurant on the Snake River. The last of the storm is moving through and we sleep well with the fresh, cool air coming through the windows. Nathan's death will leave scars on the whole family, as the senseless loss of loved ones always does. 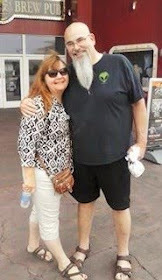 Even though Bill didn't know him well, it was especially difficult because we were hours from seeing him. We've recommitted to living our dream, and making sure our family knows how much we love them. It was Halloween when we got to Valencia, California, and we've been in the southwest corner of the country ever since. Several wonderful events and gatherings have kept us here, and now we are very ready to head north for new adventures. Except that it's so hard to leave those grandbabies! We've made more changes to our plans, and it will be 10 months before we return. Leaving is a weird combination of excited and sad. 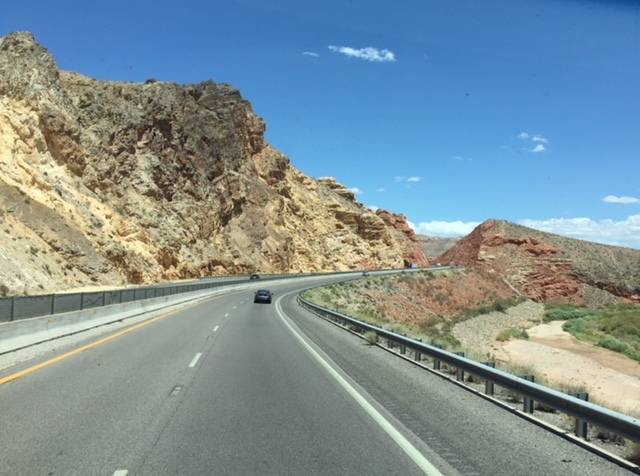 Longer than our normal travel day, we drive 268 miles to Oasis Las Vegas RV Resort. We're only here for the night so we stay hooked up, crank up the AC in the triple digit temps, and take a deep breath. 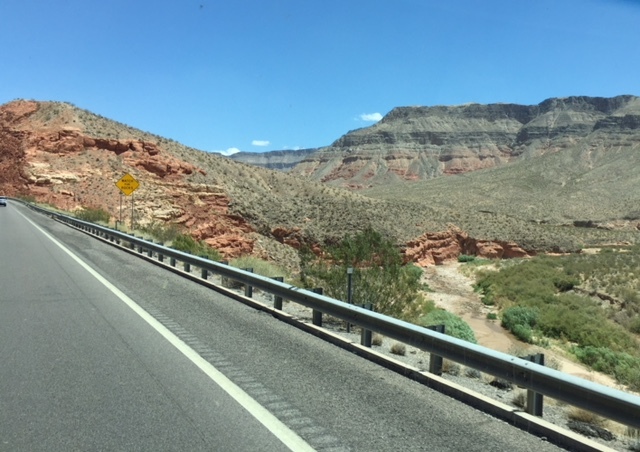 Sunday we continue north on I-15 passing through the one corner of Arizona we've yet to see. 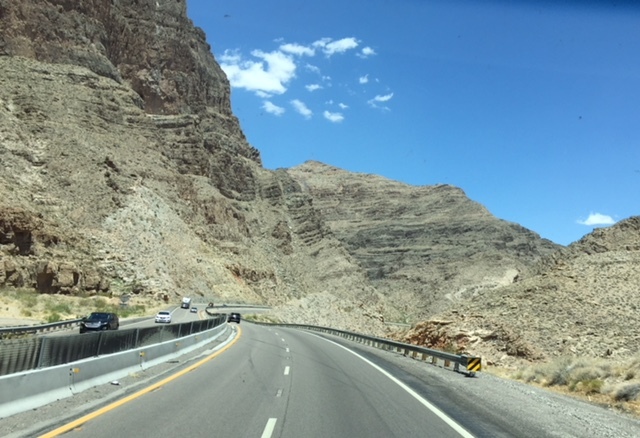 The Virgin River Gorge is another beautiful area. Then hints of red rock let us know we're back in Utah. Still beautiful, but definitely hotter than our October visit! 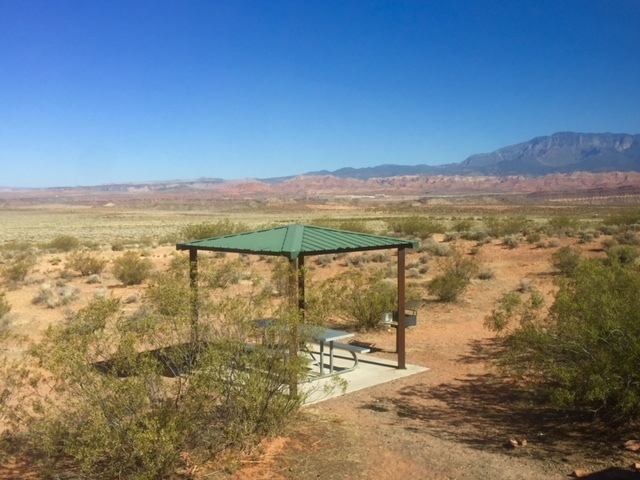 I've heard great things about Sand Hollow State Park between St George and Hurricane, Utah, so we have two nights here. We'd hoped to see friends Cheryl and Remy, but she has just had shoulder replacement surgery. We'll see them next time through. We love these Utah vistas. Lots of room and FHUs with 50 amp. Sweet on a hot June day. When we have several days in a location, we like to explore new and different places. But when we only have one full day we prefer to check out a specific location, usually one I've read about in the blog of one of our good friends. 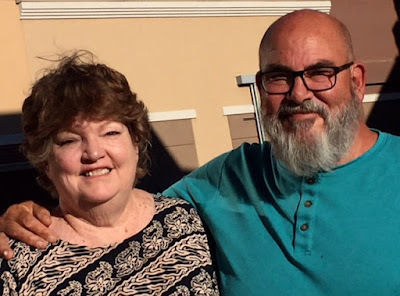 Monday morning we check out the lake, then drive east on Highway 9 to pick up Kolob Terrace Road that John and Pam (Oh the Places They Go) last visited in March. Natural beauty and a large recreation area for both water sports and ATV riding. No one but Ravens to share this pretty spot. Not far up the hill we come to a sign that says we've entered Zion National Park. Since our last visit to the main area of the park was a crowded nightmare, this is very exciting! Some sections look very "Bryce-like". The canyons open up to glimmering meadows. We travel through a few private land areas. This is an Air BnB with 360 degree incredible views. Aspen groves quake in the wind. The road ends at Kolob Reservoir. Several boondockers and tent campers surround the small lake. At over 8000 feet it is much cooler here. Taking the side road to Lava Point we're back in the park. Just the way we like our national park view points! No sound but the birds and breeze. This is Zion. All to ourselves. The Zion Visitors' Center is to the left at the V in the large cliff. West Temple (the button just right of center), and Mt Kinesava (the peak to the far right). The appropriate height for trail fencing! Looking down at a road from Lava Point. Looking back up at Lava Point from that road. The return drive offers new views. We appreciate the beauty of Zion much more now. Tuesday morning we take our time getting ready for our 160 mile drive to the little town of Fillmore, Utah. Named for our 12th Vice President, the town has seen better days. It's clean and quiet, as is the Wagons West RV Park where we set up for one night. The owners moved here from Blythe, California, and she remembers our friend Rita who still lives there. Small world! Sadly, the next morning our plans are changed by tragic news from family we're on our way to visit. Immediately after our return to Valencia, we drive the Jeep to Fresno to see Bill's mom and cousins. We arrive about 12:30 and Mom's already at the house. She was so surprised to see us!! We spend a lovely afternoon and evening visiting with the family and two of their friends who came to visit in their motorhome. It was great fun, and I didn't take a single photo! Monday morning we check out of the hotel and stop to visit with Mom at her home. Then we meet the cousins and friends for breakfast at our favorite place - Benediction. Three hours later we're back at our home! After that quick visit, we spend the rest of our week with the kids and finally getting my doctor and lab appointments done. The time flies by! Ezra brings Mommy to the wading pool to learn how to float. Splashing is much more fun. Perfect spot on a hot afternoon. My doctor agrees that I always bring her "interesting" issues, but quickly rules out any serious concerns about my weird itching. She orders labs for "everything under the sun" just to be sure. I have most of the results by the end of the day, and I'm very pleased with all the normal readings. The allergist appointment is similar, no diagnosis and lots of lab tests. She schedules a phone appointment to go over the results which will be in next week. Thursday Bill manages the impossible and gets all of the kids, including our "other" sons, and their partners and families to our place for the evening. Travis and Emily are in Aruba on their honeymoon which I guess is a reasonable excuse for missing it. Ezra shows Ella the bubble wand while her sister Autumn looks on. Maximus and his dad in the background. Ezra used up all the bubbles - what a great invention to avoid the messiness of bubble fun! 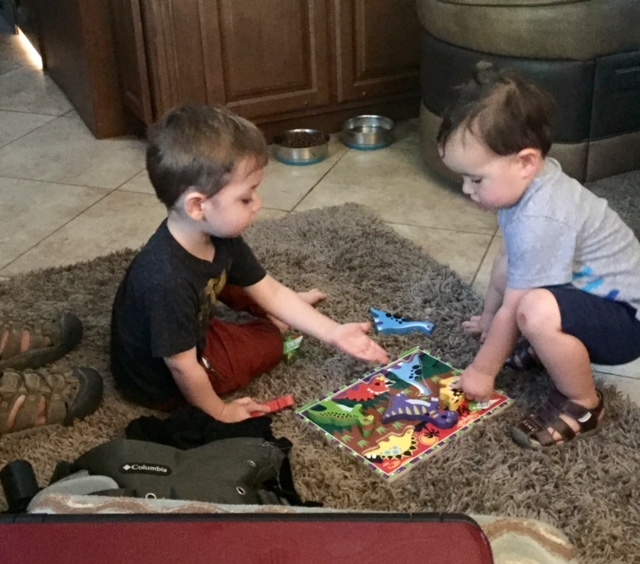 Cousins Ezra and Maximus master the dino puzzle. Hard to believe they're a year apart! All the littles - Craig, Autumn, Avery (Craig's sister), Maximus, Ezra and Ella. None of the bigs thought we could get this shot. The Gravel guys, with room for missing Travis - Corey, Richie, Bill, Nick with Maximus. Our last day started with getting my dental implant and filling. All painless, I love my dentist. I get hugs from Jeff and good-bye-for-now, and pick up Ezra for a few hours of shopping and playing at our place. He is such a delight to spend time with! When Brian gets off work he and Shalise meet the three of us at Lazy Dog for dinner. Serious things to tell us. Playing puzzles - Ezra used PopPop's hand to do some too! A brilliant kid's dessert - Fruit Loops to string on licorice vine to make a necklace. Even more fun when you sneak a few of the "beads"! It gets harder every time we have to tell Ezra good-bye. We're already looking forward to taking him with us on a road adventure!